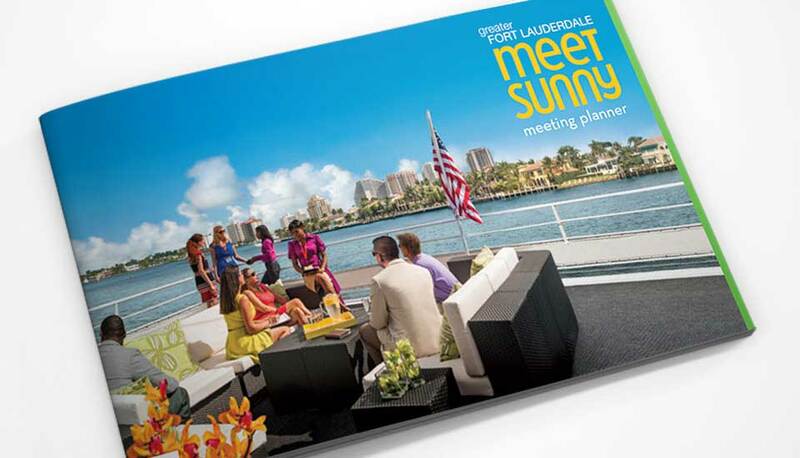 More than just sun and fun, Greater Fort Lauderdale needed to position themselves as a top meetings destination. They wanted meeting planners to know that everything they need for a sunny, successful meeting could be found in this dynamic location that’s is also a serious business destination. It’s a place where commerce happens. 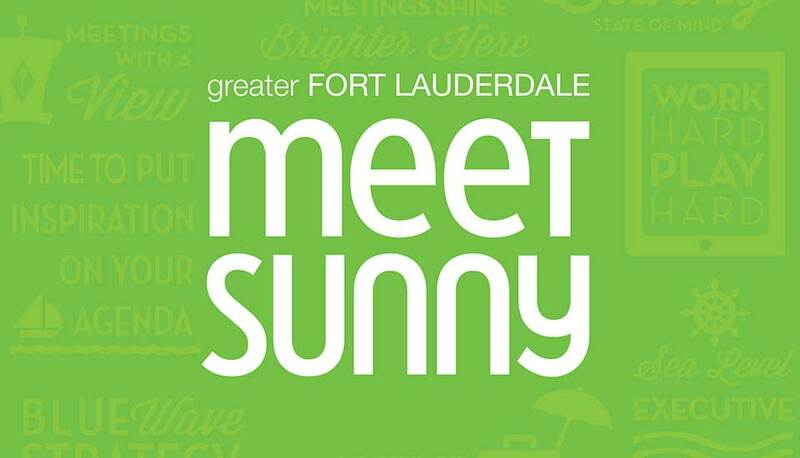 Starmark created the Meet Sunny brand, leveraging the highly successful Hello Sunny overall branding campaign, and positioning Greater Fort Lauderdale as “the lighter, brighter side of meetings.” The team developed a three-part direct mail campaign that was sent to meeting planners. Enveloped around the theme “Wake up, charge up, meet up,” each piece was uniquely designed to communicate the Meet Sunny positioning. 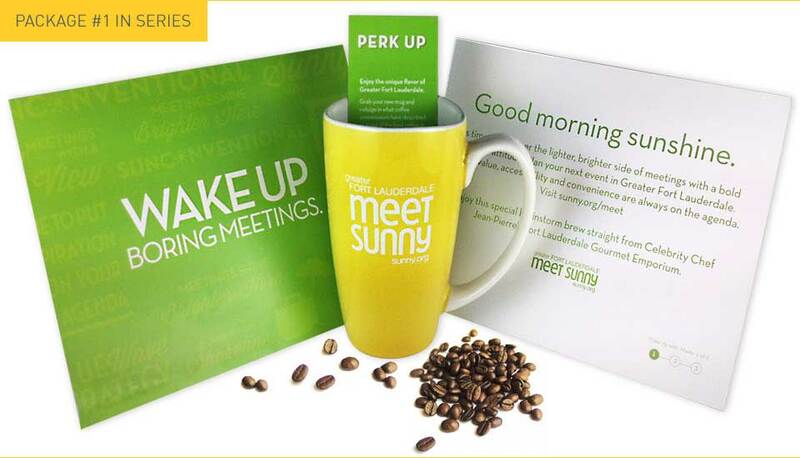 Package #1 included a sunny yellow coffee mug with a Meet Sunny logo and a fun industry related message – “Bye-Bye Boring Meetings.” Also included was a blend of local gourmet coffee from renowned Chef Jean Gourmet Emporium – a favorite off-site venue for meeting attendees. The package was purposely housed in a recycled kraft paper box, to address the environmental “green” issues and concerns that impact this industry. Package #2 followed exactly one week later. This package contained a 3-panel brochure with the headline “Charge up your team.” It featured beautiful waterway yacht meetings and other outdoor activities. 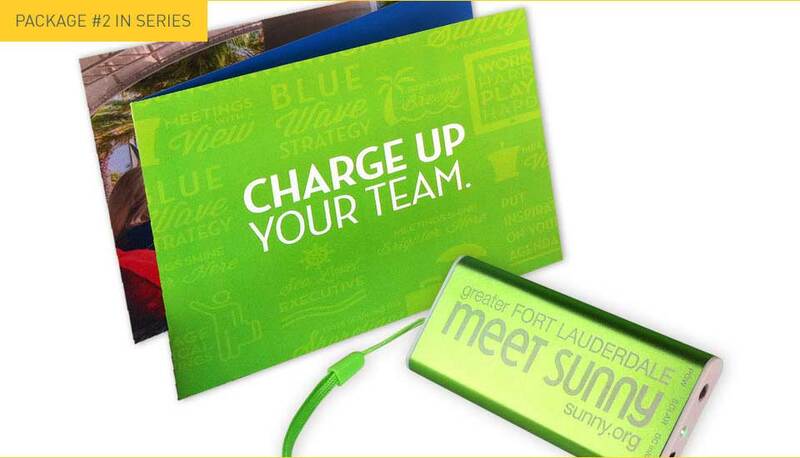 The brochure invited the reader to put the power of the sun behind their meeting and their mobile device. The package surprise was a solar powered “Meet Sunny” mobile phone charger. Package #3 followed exactly one week after #2. It included a custom brochure, with built-in video technology. 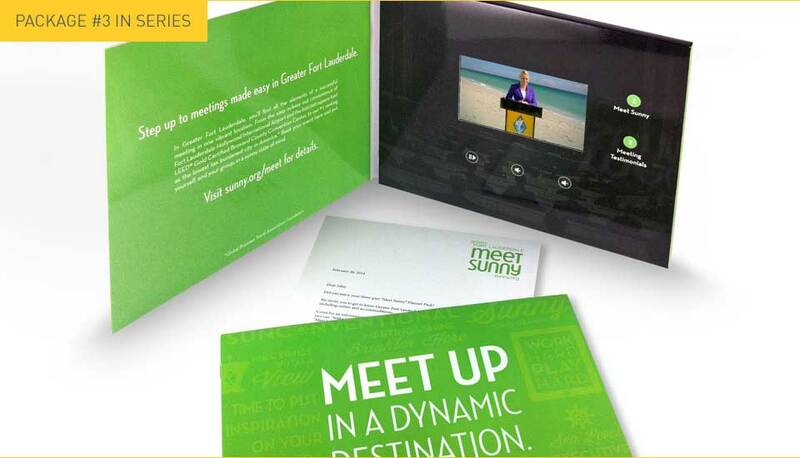 The booklet featured the new Meet Sunny video as well as testimonials. A large Annual Association Convention booked as a result of the mailer.